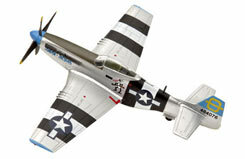 All Products > "00402 Revell 1/72 P-51D Mustang Kit"
Another legendary aircraft from the World War II era for collecting and playing. The P-51 Mustang was known as the 'tankbuster' by many due to its propensity for blowing up German tanks. Revell has beautifully presented this most fearsome (and well loved) American fighter-bomber. The "Original Heroes" come pre-painted and embossed true to the originals. Just snap the individual model parts together - no messing around with glue or waiting for paint to dry! A beautiful model which can be assembled almost as quickly as the packaging can be torn open!